Let me start by saying I would probably be better off not allowing CNN to be my “company” here in my home office as I while away the hours analyzing cultural data and developing “strategery” for my roster of global brand clients. I sometimes think I would get more out of anthropomorphic cartoons or maybe “reality” TV on Bravo (same thing?). But alas, I am stuck in a bad habit and lately have been barraged by political news as both parties warm up the melee with conventions commentary for the upcoming presidential election. As I sit passively observing the hissing, spitting, bucking, kicking and other intellectually primal behavior of the political species of human, I am inclined to put on my brand strategy hat and indulge my curiousity about how our leading political brands, the Republicans and Democrats came to adopt their appropriately zoo-like visual identities (otherwise known as logos): e.g. the Elephant and The Donkey. Here’s where I have landed thus far. To be blunt, the semiotic signification I associate with both animals are not exactly those that evoke confidence or pride. Aside from the fact that they “never forget”, elephants to me signify over-sized circus animals who get paid in peanuts to do tricks. And Donkeys lead me down the rabbit hole to dumb, slow, awkward pack animals who bear the burden of carrying people’s crap and generally are synonymous with stupidity and idiotic behavior. Don’t get me wrong: I am sure the integrity of both species in the wild defy their human-imposed stereotypes. But that doesn’t change the fact that the associations with politics seem kind of odd. So, I did some research and thought I would share what I have learned for my similarly curious ( or just bored) readers . 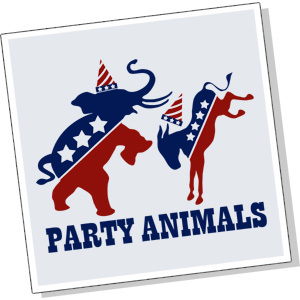 But before I impart wisdom, I have one request: I am curious to see what animals or other symbols YOU would use to represent each party if you were charged with re-branding them using a more current popular culture reference. An 1860 issue of rail-splitter and an 1872 cartoon in Harper’s Weekly connected elephants with Republicans, but it was Nast who provided the party with its symbol. Oddly, two unconnected events led to the birth of the Republican Elephant. James Gordon Bennett’s New York Herald raised the cry of “Caesarism” in connection with the possibility of a third term try for President Ulysses S. Grant. The issue was taken up by the Democratic politicians in 1874, halfway through Grant’s second term and just before the midterm elections, and helped disaffect Republican voters. While the illustrated journals were depicting Grant wearing a crown, the Herald involved itself in another circulation-builder in an entirely different, nonpolitical area. This was the Central Park Menagerie Scare of 1874, a delightful hoax perpetrated by the Herald. They ran a story, totally untrue, that the animals in the zoo had broken loose and were roaming the wilds of New York’s Central Park in search of prey.